While it is said that one cannot truly understand a country until one has lived there, the villa rental can, for the short term, satisfy travel immersion, revealing a secret side of a country in its most remote pockets. Unlike stays in even the finest hotels, the very point of renting a villa is to be transported to an inner world that is distinctly, intimately idiosyncratic of a place. It is an ideal escape from the fussing and cosseting that a hotel ensures when wishing to go local. Be it a seaside cabana in San Tropez, a sun-baked Provençal mas or a centuries-old, family-owned Tuscan farmhouse, the private villa offers the outside visitor that peek into the private lives of homes less ordinary. 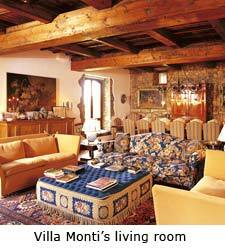 In my case, it was the peaceful, five-bedroom stone farmhouse, Villa Monti, nestled into the rolling green hills of Umbria, Tuscany's "little sister" which remains relatively buffered from the ravages of tourism. 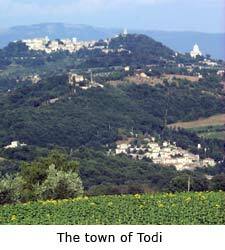 Up a pebbled drive, a good six kilometers off of any real roadway, Villa Monti crowns a hillside with 360-degree panoramic views of what seems to be the entire region, and a clear shot over the charming hill town of Todi (a favorite weekend escape of urbanite Romans and an idyllic representation of Umbria’s historical melting pot of Etruscan, ancient Roman and Medieval influences that keeps this "Green Heart of Italy" beating). 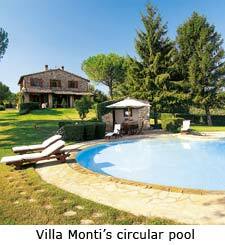 Yet Villa Monti is just one of many villas dotting the Italian countryside from which to choose. In fact, such idyllic accommodations require advance consideration, and while I freely admit to being swayed by romanticized notions borrowed from a weepy E.M. Forster novel, an armchair tour is a must to weigh the pros and cons of the mind-numbing multitude of agents available. Often word-of-mouth advice from experienced villa renters is the best opinion; but with some research, one-of-a-kind places still inhabited much of the year by families who have owned them for years, or in some cases, centuries, do await. Specializing in private vacation villas and distinctive small hotels throughout Italy, France, Greece and the Caribbean, the West Indies Management Company (WIMCO) has been servicing discerning clients for the past 20 years. A team of well-traveled agents regularly visits and often stays in each of the 1,500 properties represented, and works with local management and concierge companies to ensure top-notch accommodations and on-site service. Even before departure, WIMCO made a point of sending a detailed packet about Villa Monti, complete with driving instructions and tips (when in Italy, pack a sense of humor and an iron stomach), emergency telephone contacts of grounds keepers and recommended local grocers, cafes and restaurants. Upon arrival, WIMCO's approach is to hand you the key, show you how everything works, and leave you to your own peaceful devices. We were warmly greeted by the property’s key holder, a realtor from Home In Italy, WIMCO's continental partner, and the family's maid of 18 years, Josephina, who had family stories and legends to share, to be sure, had my Italian been up to snuff. We did learn immediately that the house dated back to the early 19th century, with some additions and restorations made in the 1980s by the father of the current owner (a director of the national Italian TV channel, but that was about all we managed to eek out of Josephina). While the thought of a cocktail hour swim in the circular pool that offered views over the heavy, ripening vines and olive groves was intriguing, the wind had picked up—the first signs of automno, Josephina assured me—and I opted instead to settle into my new digs. 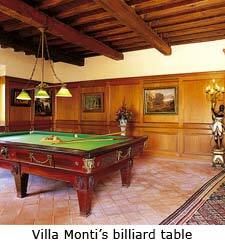 Villa Monti's décor reeks simultaneously of aristocratic good breeding and laid-back, carefree charm that has seen many years of family gatherings and boisterous bashes. Little wonder, for a central stone fireplace and French doors that open onto the patio overlooking a circular pool—all carefully designed by the family patriarch—practically demands a good house party. We half expected the cast of Gosford Park to descend at any moment for cocktails. Save for the house's "bones"—elaborate beamed ceilings, exposed stone walls, terracotta tiled floors—the details offered the only clues to our mysterious owner. All the classic components of a rustic home are there: a large fireplace and hearth whose heady aromas from fires past had infiltrated the needlepoint sofa and ottoman that invited conversation; deep window seats for an afternoon whiled away with a good book; a rich wood-paneled two-story biblioteca filled with tomes in multiple languages about Egon Schiele, investment strategies, Art Deco and billiards—one of the owner’s more obvious passions, as evidenced in the gorgeous entry hall billiard table complete with bronze lion heads for pockets. Ubiquitous botanical paintings and hunting scenes throughout the villa were offset by eyebrow-raising lithographs of libertine ladies and naughty aristocrats hinting to the master of the house's cheeky sense of humor.